I am already falling behind on my writing, which feeds into my anxiety -- hope do I expect to be a writer is I don't make time for it? How can I make time for this when I have "so many other important things" to deal with every day? This is reality, and it just so happens to be the prompt lined up for this post. Sometimes life requires your full attention and writing needs to move aside to make room. Other times writing is a space apart from reality, a safe haven where you can breathe freely and recharge, so you can face reality with a little more dignity or strength. Remember: it's not about choosing writing OR real life. Both of these things can coexist, though there will often be an ebb and flow to which one takes precedence at any given time. Honoring reality means realizing that there is room enough for both things in your life. Prompt: Tell a story about a time when you had to honor your reality. Gabriela Pereira talks about being out of balance to find our equilibrium. I know for a long time I had a long sarcastic laugh for those who talk about "work/life balance" as I don't know if there is ever a time you can just stand still in a shifting reality. Last year I shifted a lot: I had both my older kids move out (not necessarily by their choice) and found myself with just my Little Dude at home. I found that nothing tied me to the house where I spent the last six years getting both children through high school, a pregnancy, a grandchild, and a job and a new relationship. So in the fall my girlfriend and I decided to move in together with Little Dude and look, more shifting! So what is truly in balance? I work, support a young child, am living with another adult for the first time in almost ten years, and trying to figure out what I really want to do next. Writing has always teased the corners of my soul for decades, and the truth is sometimes I am just too tired to want to do something else. Yet I cannot ignore it, just like I see the other things that feed my spirit, reading and knitting and plants and colors, starting to make themselves known to me again. We all have the same 24 hours in a day, and it is up to me to do the things I want to do. So now is the time to honor my reality, to get my sea legs on the moving currents, and just follow. Writing is a superpower and every superhero has an origin story. What’s yours? When did you realize that you wanted to write? What motivated you to get started? My origin story began in pictures. I was always someone who loved to draw. THAT is the person I remember. Although my father just recounted the fact that I was reading out loud at age three, and when I was tested for kindergarten I was reading at a fourth grade level. Color me shocked. Not really. But as I said, I loved drawing from an early age. My grandfather kept me supplied with reams of paper. Literally reams of it (I apologize to the school he worked for in the seventies that must have wondered why they spent so much on paper supplies), which I spent doodling and drawing the stories in my head. I know I did a lot of Thumbelina stories, with lots of mice living underground, and others. So, I always had stories in my head. When I was in elementary school I was one of those "gifted and talented" children. Luckily my school did a lot of enrichment work with those of us who tested that way, and I remember doing some story work as part of it. I think it was fifth or sixth grade when we actually got to work on creating our own book, written and illustrated! Putting two loves like that together was just ice cream and sprinkles for me. So was born my book Super Apple and The Grape Twins. I was definitely a Saturday Morning Superheroes fan at that age in the early 80s: SuperFriends was always a must-see for me, and I loved the Wonder Twins. Except for some marker bleeding doing the illustrations, it was stapled and bound with cardboard and clear Mylar covering, handwritten story. My first book. Plus I had the added bonus of it actually going into the elementary school library collection, and I remember working the circ desk (another Gifted and Talented treat, little did I know that it foreshadowed my current career choice) and having it checked out and returned. I did continue to write in junior high and high school. We had a literary magazine that I contributed to, along with being the editor. In college I left art and writing behind, except for furtive, angsty poetry that I didn't share with anyone. When I was taking my graduate classes I came back to some creative writing in my children's literature course, as for a final project we had a choice, write a paper or write a children's book. So guess what I did? Of course I wrote a book. A children's picture book, in fact. People in that class told me I should try to have it published, but instead it sits in a file with my master's degree diploma. I didn't believe in it - or in myself. But here I am 15 years later, thinking about all the moments that I did write, and did find people reading it. Which is why I am here today, once again. Thanks for following my journey with me. I never expected to be back here again, but well, you use the tools you have, right? It has been almost three years since I posted here, and once again I am going to change things up a bit. One thing that has been on my mind, especially over the last year, is the concept of writing. Especially now that I have been with Library Journal for nine years as a reviewer and writer. I have seen friends go on to publish their own writing in other spaces: blogs, chapters, stories, books -- I want to stretch my creative wings on new endeavors. So, to that direction, I ended up purchasing a couple of titles for my own use. 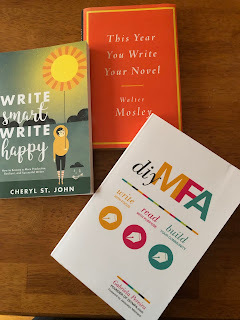 Right now, I am focusing on DIY MFA, as I know I will not be actually pursuing a new degree (hello, I have a full-time job and family, including a five-year old grandson approaching kindergarten at full throttle, although that didn't stop me from getting my first master's come to think about it), but I want to start exploring writing. I think I dreamed about writing even before I dreamed about being a librarian, in grade school, and there are definitely points stretching back *cough* forty years indicating my love of prose and poetry. Starting January 21st, you'll receive a short email from me every few days with a writing prompt on some topic relating to the DIY MFA book. While it's not necessary to have a copy of the book in order to participate, you may want to have a copy on hand. Look for it at your local library or indie bookstore, or click the link to get a copy online. If you have a blog of your own or contribute to group blog, you can use these questions or prompts as a starting point for a post. And bingo - a return to the blog has begun. What better way for me to have accountability, documentation, and my own (maybe imaginary at this point, but that is fine) cheering section than to be back here, where I did some of my most creative writing in the first place? Fair warning: with this new direction I plan to archive a large bit of the past posts, because sometimes you just need a fresh start. I do want to keep my reviews archive up and available, in case it interests people. Otherwise, be prepared for posts on writing, reading, and more writing! I already have my first prompt from the Book Club, so stay tuned.